Mill City’s Historic Railroad Bridge was built in 1888 and was eventually moved to Mill City by Southern Pacific Railroad in 1919 where it replaced the original bridge made of wooden timbers. The current structure is the last remaining Phoenix Column bridge in Oregon. The bridge reflects the special connection that Mill City and the North Santiam Canyon have had with the railroad. In 1887, Santiam Lumbering Company was formed, and Mill City was established in anticipation of the railroad reaching the area in 1888. 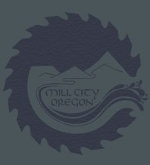 The existence of Mill City was directly tied to the ability to move logs and lumber to the local mills and to the Willamette Valley. The railroad was also the main transportation system for both people and freight prior to the development of an all-weather road system. The Santiam Lumbering Company was purchased by W.W Curtiss in 1899 and A.B. Hammond in 1900. As Hammond Lumber Company, it expanded to become one of the largest lumber mills west of the Rocky Mountains. Southern Pacific Railroad suspended service to Mill City in 1967, and in 1971 the last train crossed the bridge. A portion of the original line still services the Frank Lumber Company Inc. and Freres Lumber Company Inc. located on Lyons-Mill City Drive. The structural integrity of Mill City’s Historic Railroad Bridge was evaluated in 2014 by the Ausland Group of Eugene. Weathering and usage over time have led to the need for restoration. This includes the repair of some underpinnings and the upgrading of decking, railings, and lighting. The bridge also needs to be cleaned and painted. Mill City’s Historic Railroad Bridge serves as a well-used bike and pedestrian trail, a meeting place for friends and a prime location for river watching. It is a vital part of the Mill City water system between Marion and Linn Counties and has become a source of community pride as part of a city with beautiful scenery and historic bridges. The successful restoration of Mill City’s Historic Railroad Bridge will enhance civic vitality in the North Santiam Canyon and lay the foundation for another 100 years of public use and enjoyment. The City of Mill City and the Save Our Bridge Committee have partnered to raise $400,000 for this important project. Yes, I want to help restore Mill City’s Historic Railroad Bridge to ensure that it will continue to be an integral part of the North Santiam Canyon for the next 100 years. Buy a Tee Shirt and Button! Available at City Hall or add $5.00 shipping to have mailed via US Postal Service in the continental United States.